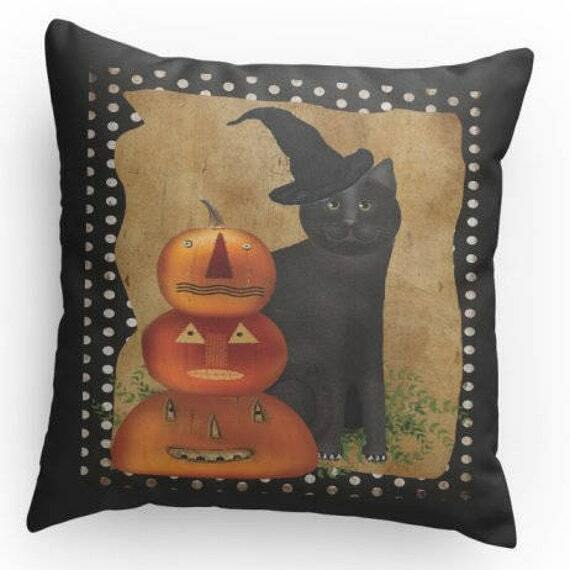 This cute folk art cat-and-pumpkin design is on both sides of the pillow, and you have a choice of three sizes, from 14″ x 14″ to extra large 26″ x 26″! It’s an easy and comfy way to dress up your home for Halloween. I love this vintage style design! The 12″ x 18″ sign is screen printed, distressed, and then a hanging wire is added. Each one is unique, with no two exactly alike. If you want this one in time for your trick or treaters, you should order it now, as it takes them up to three weeks to put this together! 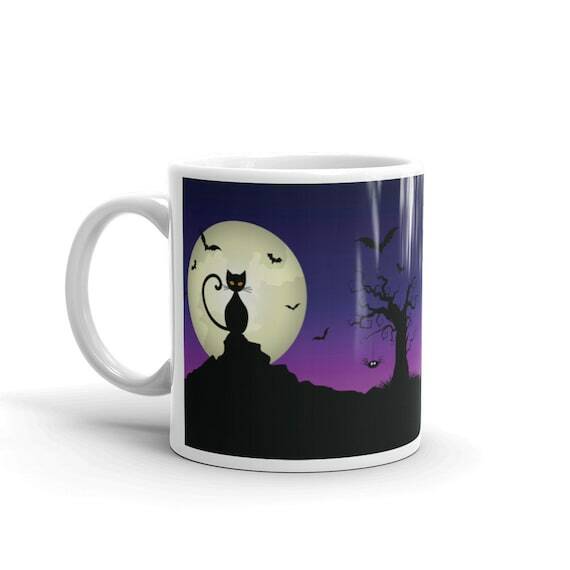 There were lots of Halloween mugs on Etsy, of course, but this one was my favorite. The colors are very festive, and the design is just spooky enough to make your October a little more fun. Enjoy 11 or 15 oz. of your favorite potion! 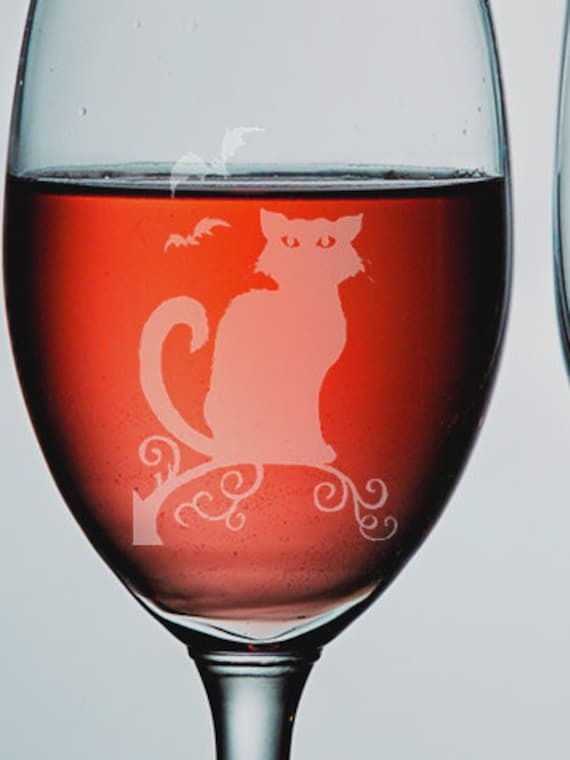 If your potion leans more to the adult variety, these black cat wine glasses are just what you need! The design is hand-etched, and you have a choice of five design styles: two sizes of stemmed wine glasses, one stemless, a champagne flute, and a pint glass. 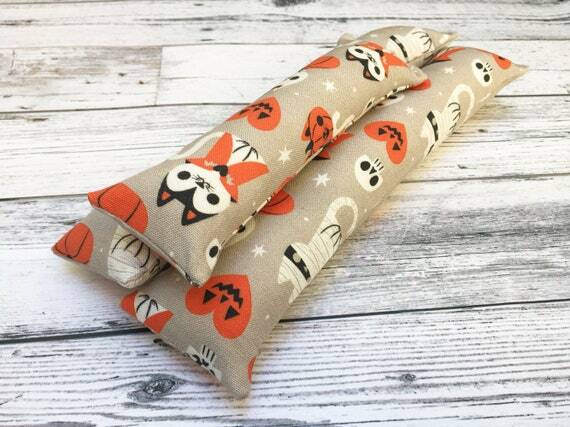 If your Halloween festivities call for something a little more formal than just paper napkins, these cloth napkins are still fun, but a little nicer! They are 16 1/2″ x 16 1/2″ and machine washable. They come prewashed with hypoallergenic detergent so you can be sure the print won’t bleed and they won’t shrink. 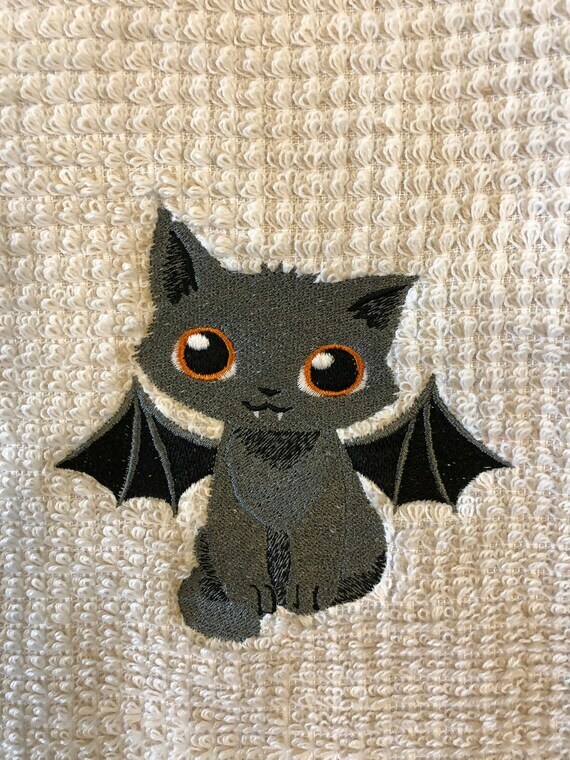 Isn’t the embroidered vampire kitty on this hand towel the most adorable Halloween critter you’ve ever seen? This 20″ x 30″ bamboo and organic cotton blend towel is just right for either your kitchen or your guest bathroom. 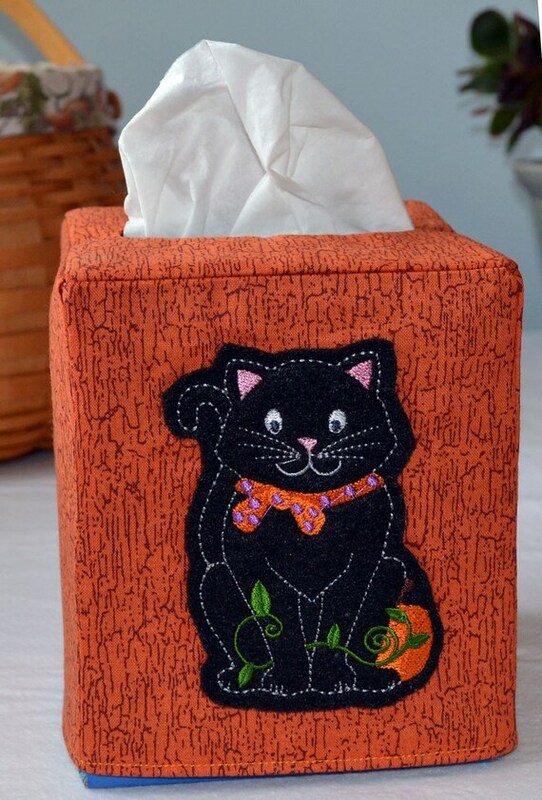 Here is a really cute item for your guest bathroom — a Halloween themed cover for a boutique square size tissue box! 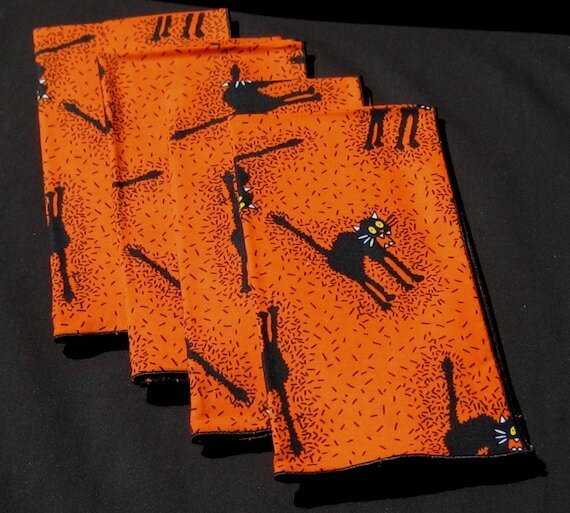 It features a cute felt black cat, and each one is a one-of-a-kind item, since the creator works with small pieces of fabric, some of which can no longer be obtained. It’s a fun accent. 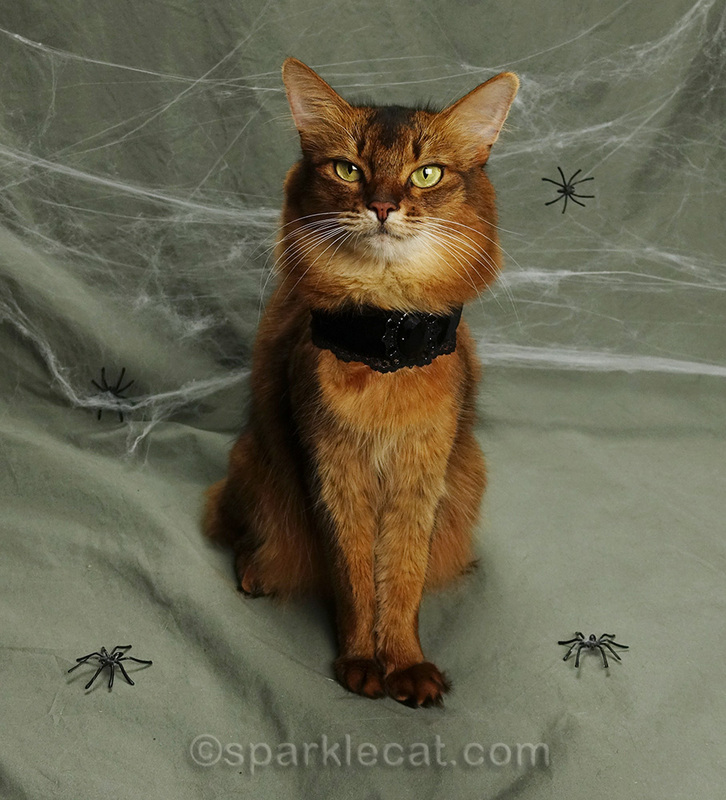 Here is a way for kitties to be festive for the Halloween season without having to wear an actual costume! You can either get the bow and collar together, or just the bow. There are also more Halloween patterns, if you take a look around. 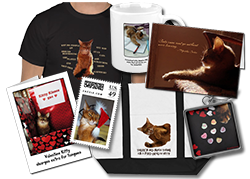 These kickers feature a really cute and durable canvas print, and an intoxicating blend of silver vine and organic catnip. The standard size is 7-1/2″ and the jumbo is 10″ of nonstop fun! 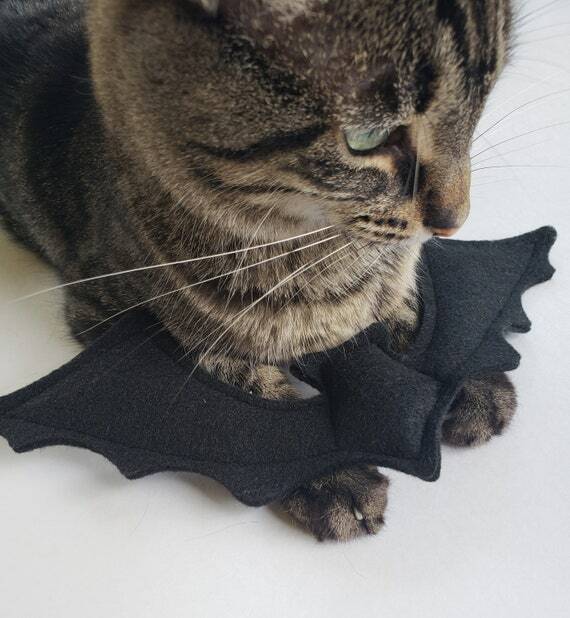 Kitties will enjoy this large, 10″ x 2-1/2″ bat toy, made from recycled felt, fiberfill and organic catnip! It’s very simple, and there are no hanging or glued on parts to chew on or swallow, and I know that’s a big plus with some kitty families. I hope you liked my picks! If you have a favorite, let me know. We can’t figure out which we like best! That vampire kitty is so cute! I like the vampire cat. 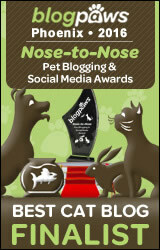 Everybody, please look at that very last picture, with the Pretty Cat wearing the Organic Bat Cat Toy. That’s MY Sydney pictured there!! Vampire cat has mesmerized me with her gaze. Also love the napkins. That is a great selection. The pillow is my favourite. I like them all! But I think the Mommy likes the vampire cat is the cutest! I like the pillow, hand towel and kicker the best. Thanks for the great selection. We like all, but we like the wooden sign the most. Nice selection, Summer! 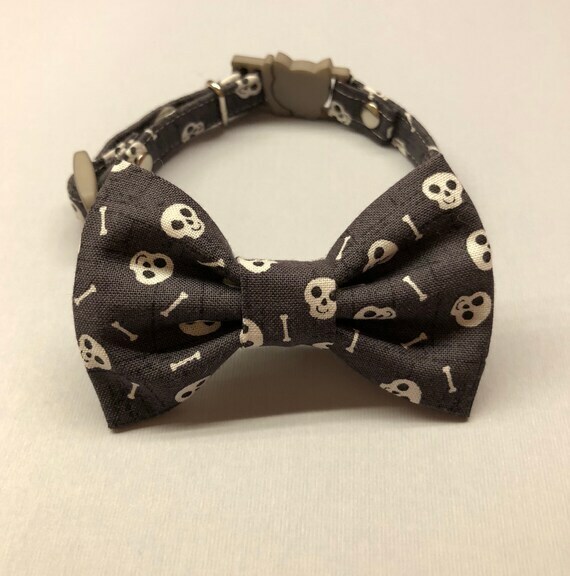 Am thinking that both Manny and Chili would look FAB in that bowtie! I don’t do seasonal decorating but I do really like that mug! Great finds, Summer! We like the kicker! SHOPPING!!! Thanks Summer, I’m going to let my fingers do the shopping this Halloween. Those are cool and festive! Those are some great pics, Summer. The mom loves Halloween decorations. Those are some really nice things sweet Summer! What a cute bunch of gifts. 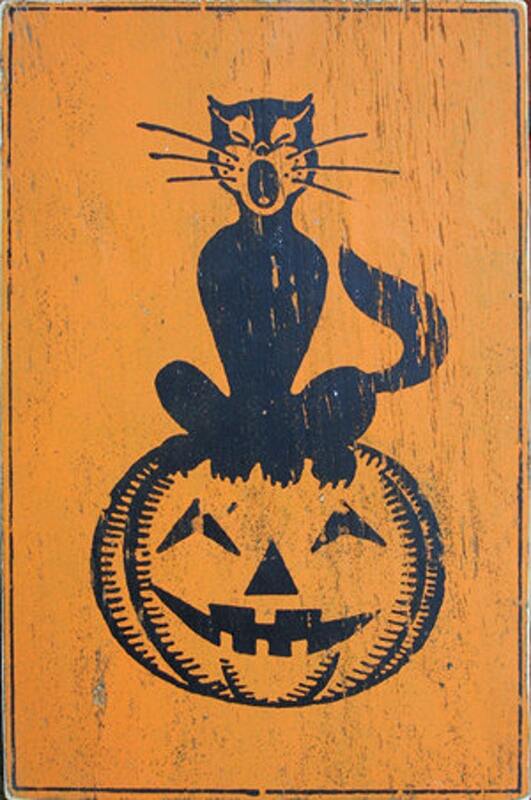 Happily, Halloween is mostly a non-event in France.